Nog beperkt verkrijgbaar... socket 775 schaars mainboard micro ATX, uitgebouwd uit werkende computer, geen toebehoren dus ook geen i/o shield.. let op heeft alleen VGA aansluiting (niet hdmi, dvi zoals op website van intel staat). Gecontroleerd, 6 maanden garantie. Explore the great multitasking performance and legacy features of the Intel? Desktop Board DG41WV. 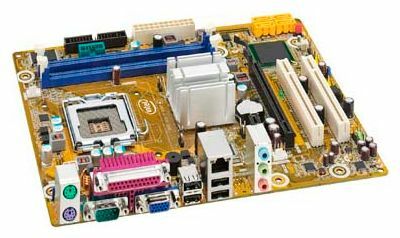 This board is designed to run with Intel? CoreTM2 Quad and Intel? CoreTM2 Duo processors in the LGA775 socket. Offered in micro-ATX form factor and supporting a PCI Express* Revision 1.1, 2 DIMMs slots for DDR3 memory, and eight back panel USB 2.0 ports, you can build a feature-rich system with these expansion capabilities. The Intel? Desktop Board DG41WV is Microsoft Windows Vista* Premium and Windows* 7 WHQL-certified.